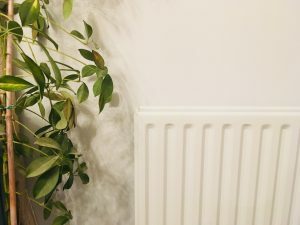 This is my post about how to hide a radiator. If you can’t view the video, please click here. I know it’s a little irrational. I know there are many more important things in life. I am also aware this is very much a first world problem. It’s still enough of a hatred to compel me to make a video about it! So I thought I’d put together some possible solutions to this pressing matter, as I know I’m not alone. Warning: if you haven’t noticed how ugly radiators are, you will now be eternally offended by them! It’s so annoying that no matter how good the décor of a room is, if it has a stinking radiator in it the whole effect will be ruined! But there are of course solutions. The type of radiators I’m talking about here by the way, are the bog standard old and new ones. I appreciate there are some very attractive, sophisticated products on the market. They can look very cool in a modern house, but not with my style of décor. I also appreciate that many swear by underfloor heating. Again this isn’t always practical. Firstly, it’s ruddy expensive to install retrospectively – particularly in a Victorian house like mine. Secondly, if you want to keep the original Victorian floorboards you do have to go with electric underfloor heating, which has it’s own drawbacks. I know there are many alternatives these days, but this post is more about covering up the rad you have already, or the one you can only afford to have. 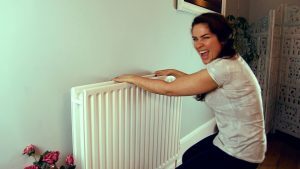 If your radiators are old, it’s likely they are less efficient so if you can afford it you want to update them anyway. My plan is to gradually work my way through the house replacing my rads with the cast iron, Victorian style ones. This is pretty expensive though, so what to do in the mean time? The most simple and cost effective solution is to paint it. If you paint the radiator the same colour as the wall it does help to merge it into the background. I used eggshell and needed about 4 coats for it to look good. If your rad has been painted before you will find you need fewer coats. It’s best to use a water based paint, but still expect it to smell for a little while when the heating comes on. 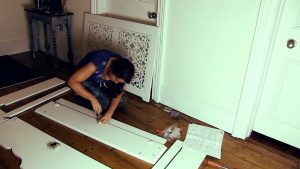 Radiator cabinets I must warn do make the radiator less efficient, so you may consider removing them when the heating is on if you are conscientious. Rightly so too! You can get cheaper versions from the likes of B&Q and Homebase if your budget is tight. I did, however, get very excited when I came across a company called Jali. 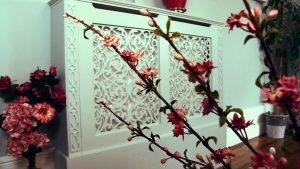 They have the most beautiful selection of radiator cabinets, among other furniture. You can choose from a huge array of different sections, and design it yourself to suit the measurements of your radiators. I now have one in my dining room and one in my lounge, and for me they really add to the room’s scheme. They are self-assembled, but it took me only about 25 minutes to put one together. The bonus for me is that where I used to have an unusable area of wall space, blighted by a great big ugly rad, I now have a shelf to dress. And that’s how you hide a radiator. If you like to cover up other ugly things you might be interested in this post and video where I show you how to make a cover for a gas meter, which could also be used for covering a radiator.